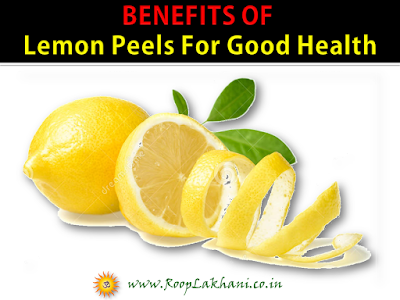 Did You Know Lemon Peels Are Good For Your Health? It is a common practice to discard lemon peels after squeezing the lemons. But did you know that lemon peels are power houses of vitamin C, folate, beta carotene, calcium, magnesium and potassium? You can use the peels in grated and chopped form to get the maximum health benefits from lemons. Lemon and lemon peels being rich in Vitamin C (antioxidant properties), and soluble fiber are among the preferred food ingredients for people with diabetes. They help in regulating sugar levels thereby controlling diabetes. Lemon zests are a rich source of polyphenol flavonoids and fiber and help in lowering the cholesterol levels.They also help in regulating blood pressure and other heart related diseases. Being super rich in vitamin C, lemon peels are a great recipe for glowing skin. Lemons and their peels actively cleanse skin pores and improve skin tone. Increased intake of coffee, tea, smokes gradually darkens your teeth. A lemon peel when rubbed on the surface can effectively lighten the stains and whiten your teeth. -To include lemon peels in your food and drinks, remove the thin layer/ peel/ zest of the lemon, refrigerate and preserve it by grinding and chopping the lemon zests. – Make sure you do not peel along the white part of the peel. -For skin application, rub the peels on the face and other areas of skin. – You can also add lemon extract to your regular face packs. – To whiten your teeth and remove stains, rub the peels daily on the teeth. So, next time you use lemons, make sure you do not toss the peels in the bin as they are packed with vitamin C and other nutrients. Stay Healthy, Stay Happy!